This episode contains a number of revelations. But do they make sense? Do the “shocking twists” grow out of things we’ve been told, or do they come out of left field and leave us feeling cheated. I’m going to try to figure this out. Let’s begin. To start, let’s admit that we really don’t know anything more about the red signals than we did in episode one. This episode speculates that the Red Angel is creating them and then using them to get Starfleet’s attention. That seems to be a stretch. The Red Angel does not appear to be present every time the signals appear. The signals are still a mystery. Okay, what about the Red Angel? After all, it pretty quickly began to supercede the Red Signals in the story. As the episode begins, we find out that Ensign Tilly (Mary Wiseman) has come across code that was implanted in Airiam’s system by a digital parasite. It is here she finds a file labeled “Project Daedalus.” The file contains a bio-neural signature from the Red Angel, which is a match for Michael Burnham (Sonequa Martin-Green). That’s a shocking revelation. Side bar: Was Tilly working in a sandbox environment? Given the nature of the future AI, it would seem that any trace of its code would be be extremely dangerous. In fact, Saru (Doug Jones) points out that Section 31 ships had all performed scans to make sure that the future AI had not infected their systems. Presumably Discovery ran the same scan. Apparently those diagnostics couldn’t detect code injected by a digital parasite. And Leland (Alan Van Sprang) might agree. If he survives being stabbed in the eye. But, back to the Red Angel. Dr. Culber (Wilson Cruz) performs tests on Commander Burnham and says that every test shows a 100% match between Burnham and the bio-neural signature found in the Project Daedalus file. He assures Admiral Cornwell (Jayne Brook) that he could detect if the signature had been artificially created. This assures us, the audience, that this is a fact we can build on. Yet, the information we have by the end of the episode would lead us to believe it was not Michael Burnham’s signature, but that of Burnham’s mother. Was Culber incorrect? Is the signature so broad that it covers both parent and child? That would certainly make the tests next to useless. Or have we been mis-directed once again? Analyzing information supplied by Section 31, Stamets (Anthony Rapp) explains that the time travel suit works by creating a micro wormhole that the suit can go through. He explains that, because wormholes are inherently unstable, the suit generates a protective membrane that travels with the suit. Essentially, the suit is tethered to its starting point — a point in the future. And that this is how the future AI is slipping through to the past. We also learn that Michael Burnham’s parents created the Red Angel suit. But, since the suit was created several years in the past by Burnham’s parents, just how far in the future could its origin point be? As mentioned, Leland reveals to Burnham that her birth parents were the ones who developed the Red Angel suit. He also says that he was inadvertently responsible for their deaths at the hands of the Klingons on Doctari Alpha. For years, Burnham has lived with the belief that she was responsible for their deaths, as she had begged them to stay on the planet to see a nearby supernova explode. Burnham has, in the past, recounted the story of how she, hiding in a closet, had heard the Klingons kill her father, then her mother, then sit down to enjoy the dead family’s meal. So, we, the audience, should accept the fact that young Burnham actually heard her mother being killed. In fact, she recalls the Klingons taking their time to commit the crime. But now that may not have been true. Finally, Spock (Ethan Peck) believes he has uncovered the secret to determining when and where the Red Angel will appear. The Vulcan surmises that Burnham is the variable. Spock and Burnham explain to Captains Pike and Georgiou (Michelle Yeoh) that the Angel appears when Burnham is in danger. Therefore, putting Michael in mortal peril will cause the entity to appear. However, this conclusion does not appear to have any logical backing. Consider the Angel’s first appearance to young Spock. Burnham was in danger and the Angel appeared to show Spock the young girl’s gruesome end, then showed him where to find young Burnham in order to save her. This would have been the least efficient and even least maternal route to take. Since the Forge creature was scared off by the light and sound of the Vulcan shuttle, there’s a very good chance it would have been scared away simply by the appearance of the Red Angel. But, you say, perhaps Spock reasoned that the person in the Angel suit thought it would be best if Burnham did not see them. Why, then, did it appear to Burnham when she is injured and trapped on the asteroid? Another thing odd about the appearance to Burnham on the asteroid is that Captain Pike instantaneously appeared in that same spot where the Commander was looking at the Angel. He would have seen the Angel, too. But, you say, perhaps it can, for some reason, only be seen by one person at a time. This is not the case. Everyone in the church on Earth saw the Red Angel. And it was seen by both Saru and Siranna when it appeared on Kaminar to disable the Ba’ul ship. Speaking of that appearance, there was also no indication in this appearance that Michael Burnham was in any immediate danger. She was on board Discovery. In the end, when the Red Angel is trapped on Essof IV and Michael Burnham’s mother (Sonja Sohn) emerges from the suit, it is shocking. But I don’t see how it was earned. Perhaps, in the remaining episodes, we will see the pieces turn in a different direction, so they can ultimately fit nicely into place. The Red Angel guided Spock to a remote planet and showed him a vision of armageddon on a galactic scale. Why the long trip? During the funeral scene, we see that Discovery is capable of running on autopilot. Is this a foreshadowing of the events in the “Short Treks” episode “Calypso”? There, the unmanned ship has maintained position for a thousand years. Aspects of Airiam’s funeral were very reminiscent of “Star Trek II: The Wrath of Khan.” That movie continues to be a major touchstone for Trek productions. Are we stuck in a time-travel loop? The AI sneaks in from the future, infects Airiam and used her to upload information from the sphere into Control, so that Control can evolve. Does that mean the future AI is an evolved Control? If so, why does it need to come back to get information into this version of the system? Saru says that Control was only used by Section 31. In the previous episode Admiral Cornwell said Control was not accepting her input. She said that once the red signals started to appear, Admiral Patar lobbied Starfleet to have decision-making turned entirely over to Control. One would assume that Control was issuing threat assessment decisions to Starfleet. If it were not, wouldn’t all of Starfleet be concerned? What is Georgiou up to with Stamets and Culber? Is she just amusing herself? It was a nice beat to have Spock forgive Burnham and watch her take a breath, as a weight is lifted from her shoulders. Burnham’s parents believed that certain technological leaps, including ones on Earth, were not the result of happenstance, but time travel. That sounds like an Erich von Daniken “Chariots of the Gods” line of reasoning. This week’s offering, “New Eden,” feels like a story severely hobbled by arbitrary time constraints. Conversations are truncated, introductions are brief or non-existent. However, even with a running time more than 15 minutes shorter than last week’s episode, the script does deliver on many levels. In what I would call the “A” story, Discovery attempts to intercept a second red signal. This involves using the spore drive to jump to a location over 50,000 light years away, in the Beta Quadrant. When the ship arrives, the signal has once again disappeared. However, Discovery does find something at the location — an M-class (Earthlike) planet, surrounded by rings comprised of radioactive debris. Even more intriguing, the planet is inhabited by humans who have been on the planet 200 years, long before Earth discovered warp drive. At this point, the viewer might begin to wonder if the signals are leading Discovery around the galaxy on some “Quantum Leap” type adventure. Captain Christopher Pike (Anson Mount), meeting with First Officer Saru and Commander MIchael Burnham (Doug Jones and Sonequa Martin-Green), wonders much the same thing. And thus begins an impromptu debate between science and faith. Why did that second signal want us to come here? As science officer, I would advise restraint in ascribing motivation to what are now simply unidentifiable energy bursts. I know my Shakespeare, Captain. Are you suggesting that some kind of divine intervention put those people on the planet? But there appears to be more to Pike’s musings than he lets on. When the Captain learns that the “First Saved” were transported from Earth to the planet, which the inhabitants call Terralysium, he seems transfixed by their decision to combine all of Earth’s major religions into one doctrine. Later, even though he holds fast to his decision that General Order One (AKA, the Prime Directive) applies to Terralysium, meaning Starfleet cannot interfere with the natural development of the society, he beams down to the surface. Dressed in his Starfleet uniform, he speaks with Jacob (Andrew Moodie), a New Eden citizen whose family had always sought to learn the truth about the events surrounding the First Saved. Pike tells Jacob, “I lied, to protect the others from the truth. The truth is, you were right about us. I know what it’s like to live with doubt, and I guess I didn’t want that for you.” Pike hands Jacob a power source that allows the truth seeker to, once again, fill the town’s church with light. Is the doubt Pike lives with something about his command? His relationships? Or, perhaps, it is an internal conflict concerning science and faith? Earlier we learn that Pike’s father was a science teacher who also taught comparative religion. As Pike puts it, “It was a confusing household and we didn’t agree on a lot.” Did the debates in the Pike household mirror his conversations with Burnham? In the episode’s “B” story, Ensign Sylvia Tilly (Mary Wiseman) is struggling to find a way to use the metrion-charged asteroid Discovery captured to develop an alternative interface for the spore drive. Lt. Commander Paul Stamets (Anthony Rapp) has confessed to her that he had previously seen his deceased partner, Dr. Hugh Culber, inside the mycelial network. The experience shook Stamets, who is now very reluctant to interface with the drive. When Tilly slices off a piece of the asteroid, she is hit by a charge of unknown energy, knocking her unconscious. Later, in sickbay, Tilly is greeted by an unfamiliar woman in a Starfleet uniform. We later learn that the woman, May Ahern (Bshia Watson), was a junior high school classmate of Tilly’s. And Ahern died in 2252. The “manifestation” appeared to be pushing Tilly forward, acting as a catalyst to help the ensign realize how she can use the asteroid to save the planet. Whatever the entity’s purpose, it appeared genuinely delighted to observe Tilly’s unorthodox thought process. Do the two main stories create a unified theme for this episode? Not quite. But they may yet intersect as the season progresses. Elsewhere, this episode continued last week’s trend of letting secondary members of the bridge crew shine. Lieutenant Junior Grade Joann Owosekun (Oyin Oladejo) joined the landing party and showed that she is more than capable of improvising solutions to problems. We also learned that she was raised in a luddite collective. How she found her way to Starfleet could be an interesting story. Meanwhile, on the bridge, Lt. Keyla Detmer (Emily Coutts) demonstrated her outstanding piloting skills. Her “Donut” maneuver with Discovery was impressive. The inhabitants call their planet Terralysium. This is a reference to Elysium. In Greek mythology Elysium is the final resting place of the souls of heroes and those of great virtue. Those deemed worthy were conveyed there by the gods. Could the name have been chosen by the settlers as a non-Christian way of saying a heavenly version of Earth (Terra)? Yes. Yes, thank you. I’m supposed to be on bed rest, but that is practically an affront to my very existence, ’cause the ship’s in high alert, the captain, Burnham, Owo, not to mention an entire planet might be nuked, and that is not happening! Why are you looking at me like that? You’re May, right? Am I talking too fast? I’m problem solving. I’ve had espressos. Yes. And don’t make me laugh. Pike laughs, then winces in pain. Maybe I should just shut up. 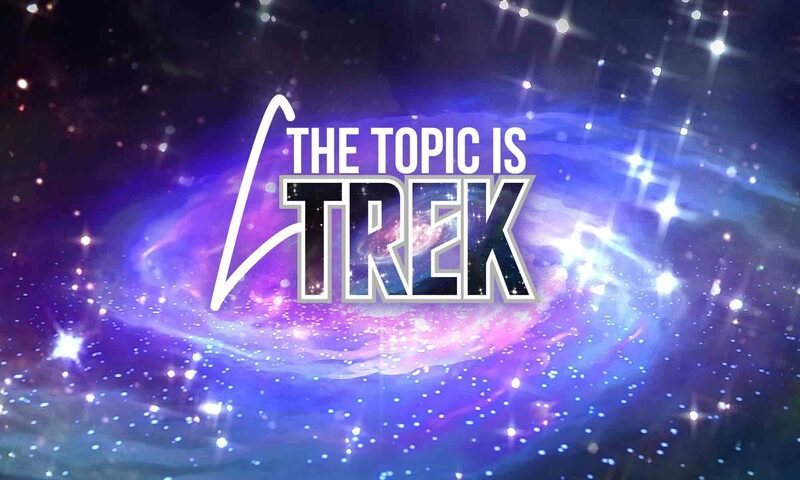 In this episode, Saru (Doug Jones) succumbs to the call of the Pahvans, and Burnham (Sonequa Martin-Green) must try to convince him to complete the landing party’s mission. Two things struck me about the story: first, the episode reminded me of another classic “Star Trek” adventure and, second, it made me ponder the likelihood of achieving happiness in the “Star Trek” universe. In “Si Vis Pacem, Para Bellum,” Saru, Burnham and Tyler (Shazad Latif) beam down to the surface of the planet Pahvo in an attempt to figure out how to utilize the planet’s unique resources in the war against the Klingons. Trying to communicate with the planet’s essence, Saru has a transformative experience. He abandons the mission in favor of his his own agenda. You might be tempted to draw parallels between this story and the classic “Star Trek” episode “This Side of Paradise.” In that story, the crew of the Enterprise is affected by spores native to the surface of Omicron Ceti III. The crew abandons ship and plans on living in virtually eternal harmony on the planet surface. Saru is similarly affected by contact with the native entities on Pahvo. Or is he? It does not appear that Saru is actually under any type of spell. Instead, he has been freed from the genetic burden carried by every Kelpien. For the first time in his life, he is no longer afraid. Clearly he can still reason for himself. He can lie to his fellow crewmen or even attack them and destroy their communications equipment. Burnham sets her phaser to stun and attempts to subdue Saru. This is not the same as Kirk provoking Spock in order to free the Vulcan of the Omicron Ceti spores. Burnham’s goal was to immobilize Saru. Attempting to reason with the Kelpien was secondary. In “Generations,” Soran was exposed to a place outside of normal space-time called The Nexus. Guinan, who had been inside the Nexus at the same time as Soran, describes it is asa place of pure joy. “As if joy was something tangible and you could wrap yourself up in it like a blanket. And never, in my entire live, have I been so content.” Guinan, Soran and others were then unceremoniously ripped away from the Nexus. While Guinan realized the impracticality of attempting a re-entry, Soran pressed on. He was driven by a singular desire to regain that bliss. Eventually he devises a way to get back to the Nexus. The fact that his plan includes destroying suns and would mean the deaths of hundreds of millions of souls was of no importance to him. That was just collateral damage. It might seem to be a stretch to equate Soran’s actions with those of Commander Saru, but is it? After all, as Tyler pointed out, if their mission on Pahvo was unsuccessful, the Klingon-Federation war would rage on. Saru was well aware of this. He purposely prevented Burnham and Tyler from contacting the Discovery, crushing their communicators and smashing the uplink device. “But I was,” Saru replies, with sadness in his voice. Emotion, not infection, drove both Soran and Saru to do what they did. And Saru must now live with that knowledge. But the second question raised here is, can anyone in the “Star Trek” universe actually be happy? Saru realizes that he cannot have both his freedom from fear and do what is needed of him to save the Federation. Likewise, Captains Picard and Kirk prevent Soran from reaching the bliss of the Nexus. The same Nexus Picard begrudgingly ripped himself from, convincing Kirk to do the same. This is a repeating scenario in “Star Trek” – a character or species or civilization seems to achieve peace only to have it taken from them. McCoy finds happiness on the asteroid spaceship Yonada, but loses it due to the actions of Kirk and Spock. Kirk finds happiness with Miramanee, only to see her stoned to death while carrying their unborn child. Picard finds fulfillment on Kataan, then discovers it was all in his mind. Benjamin Sisko loses his wife in the battle at Wolf 359. He finds happiness again with Kasidy Yates, but must leave her and and his son, Jake, because the prophet in the Celestial Temple still has much left for him to do. Kira loses Odo. T’Pol loses Tucker. And they both lose their child. Data also loses a child. And so on and so on. Is the lesson that the only way to be happy is to struggle towards that as an unobtainable goal? Or is it just a reminder that the human adventure is just beginning? Or was it best summed up in the musical “A Funny Thing Happened on the Way to the Forum”? Is Admiral Cornwell dead? A slip of the tongue during “After Trek” seems to indicate we will see the character again. Was L’Rell’s interest in knowing how the Federation treats prisoners, and her desire to be brought aboard Discovery, related in ways we have yet to see? Pahvo and Pandora: separated at birth? We see Tyler getting a medical exam in sickbay at the end of the episode. Burnham is well aware that her ultimate fate still leads her to a prison cell. Is this Tyler and Burnham’s second first kiss? Time is so wibbly wobbly. Several Klingon ships that survived the attack on the Gagarin have now seen Discovery simply spin and vanish. What Discovery is doing is certainly no longer a secret. In a series where flawed heroes will either rise or fall, the U.S.S. Discovery may be the most flawed of all. The U.S.S. Discovery is a doomed ship. At least its mission appears to be. After all, the biotechnology research that Lt. Paul Stamets (Anthony Rapp) is conducting bears no resemblance to anything we have seen before, or since, in the “Star Trek” universe. That would indicate one of two things: the experiment is a catastrophic failure, or the experiment is a resounding success which places the ship out of this universe, if not time itself. Either way, Discovery, or at least members of its crew, are most likely doomed. Discovery’s sister ship, the U.S.S. Glenn, has born witness to the volatile nature of the so-called “spore drive.” That ship’s attempt at a “Speirein 900” displacement apparently propelled it to the edge of Klingon space, but also killed every crew member on board. Stamets’ friend and colleague, Straal (Saad Siddiqui) spoke of the advantages of “not growing your own,” possibly hinting at the involvement of the creature that rampaged through the corridors of the Glenn. That creature is now aboard Discovery. And what do we know of Discovery? We know that she is “right off the assembly line” new. We see that her Captain, Gabriel Lorca (Jason Isaacs) not only wants to win the Federation-Klingon war, he is willing to do anything at all to make that happen. We see indications that Discovery’s security officer, Comdr. Ellen Landry (Rekha Sharma) has no use for Vulcans. And there are indications that the science being conducted aboard Discovery is probably not something the United Federation of Planets would approve. As we learned in episodes one and two, each character on “Star Trek: Discovery” is presented to us with a potentially fatal flaw and will be defined by how they act over time. That could very well include the Discovery herself. Last week I spoke of the journey of Michael Burnham (Sonequa Martin-Green). How far she had fallen, and what heights she must scale to reach redemption. In “Context is for Kings,” she had to run the gauntlet of scorn, ridicule and rejection to finally begin the long climb up, both figuratively and literally. It has been six months since Burnham was sentenced to life in prison for her crimes. Crimes she confesses to Saru (Doug Jones) that she thinks about every single day. She has withdrawn into herself, defaulting to her swallowed-emotions Vulcan upbringing. She is so far removed she does not even struggle against the impending destruction of her prison transport shuttle. In fact, she seem calm in the face of near-certain death. It seems nothing in this universe can break through that wall. Nothing, save one thing: the relentless, unbridled, enthusiasm of Cadet Sylvia Tilly (Mary Wiseman). Not at first, of course. This relationship starts off as icy cold as space itself. Then tension turns to an uneasy truce. By the end of the episode, Burnham shares not only a book with Tilly, but something more precious — a memory. It seems that Tilly will play a key role in Burnham’s journey. So now we must also carefully watch Cadet Sylvia Tilly. She may be our canary in the coal mine. If her enthusiasm sours, or something untoward happens to her, Michael will surely stumble. And on board the U.S.S. Discovery, a stumble can be a very, very dangerous thing. Is Lorca so badass he can actually stop a tribble from reproducing? The [threat ganglia] on the back of Saru’s neck have flipped open again, this time as the prison shuttle departs. The first time we saw this, the Klingon ship decloaked in front of the Shenzhou.